Find 50% Off Car Part Orders at Euro Car Parts - Brakes, Filters, Oils and Suspension Discover some great savings with this Easter deal. 34% Off Selected Orders at Euro Car Parts Make sure to use this discount code to get a great 34% off. Discover 54% Off Tool Kits at Euro Car Parts Tools not up to the job? Save up to 54% off tool kits at Euro Car Parts today! 75% Off Selected Philips Bulbs at Euro Car Parts You'll be staggered by the savings you could make with this great deal at Euro Car Parts. 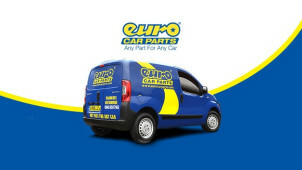 Free Delivery on Selected Orders at Euro Car Parts There's no minimum spend at Euro Car Parts - delivery won't cost you a penny! Free Click and Collect on Orders at Euro Car Parts Scrap any extra charge on your orders and pick up your package at your convenience completely free with the click and collect at Euro Car Parts. 365 Day Refunds and Exchanges at Euro Car Parts If you're not 100% certain you want to keep your order, you can return it for refund or exchange for up to 365 days after your purchase. Up to 50% Off Plus Free 5L Screenwash on Click and Collect Orders Over £40 at Euro Car Parts Shop the amazing Easter sale at Euro Car Parts and get a free 5L of screenwash on orders over £40 when you choose click and collect. Euro Car Parts use their expertise to get you the best deal on a huge range of parts and motoring essentials with minimal fuss. Use the handy entry form to enter your car registration number, before selecting the make, model, year, engine size and fuel type to be directed to the parts made for your vehicle. So if even you’re an amateur mechanic, there’s no chance you’ll waste time and money ordering the wrong parts. We all love and look after our cars, therefore, it’s important that the parts you use are the highest quality. All parts on Euro Car Parts are tested to ensure the highest standard is met without compromising on the price. So, if quality and value for your money is what you are after, then look no further. Make sure to also look on site before heading in-store as there are some fantastic online only flash sales and offers to help you save on your next car parts purchase! How do I use my Euro Car Parts discount code? It’s always worth checking the Euro Car Parts Clearance section first - they might have exactly what you’re looking for at up to 80% off the retail price! Does Euro Car Parts offer a price match? Think you’ve found the same part for cheaper elsewhere? The Euro Car Parts Price Match Promise will ensure you don’t pay a penny more than necessary, so you can budget efficiently to get all the parts you need in one place. Where is my nearest Euro Car Parts? From Aberdeen to York, Euro Car Parts has a handy Store Locator to help you find your nearest store. Just enter your postcode or choose a town or city to find out your local Euro Car Parts’ opening hours and address. A large number of stores including; Aberdeen, Edinburgh, Birmingham, Nottingham, Gloucester, Exeter, Truro and Oldham are open 7 days a week! What are the Euro Car Parts delivery options? If you’re ordering your parts online, you’ll enjoy free economy delivery on all products, so you needn’t worry about making the trip to store to save a couple of pounds. If you need your product to arrive before or on a specific day, Euro Car Parts provide a choice of premium delivery services including Super Save 48 Hour, Next day, and Same Day Delivery. Euro Car Parts offer refunds 365 days a year. Please return the product to a local Euro Car Parts branch. Alternatively, Euro Car Parts can arrange the collection using our carrier DHL at a subsidised cost of £3.45. Euro Car Parts will pick up the item for free. Alternatively, you can return it to your nearest branch. You can find further details on their returns page here. Get your car ready for your next adventure with the team at Euro Car Parts. Supplying parts for all makes and models, Euro Car Parts now has more than 190 locations over the UK serving over 120,000 customers annually. Now, with a Euro Car Parts discount code, you can benefit from its great services for less! Find the parts to improve the running and appearance of your motor today, and fix it up for a better price with vouchercloud. With 200+ stores nationwide and an online customer base stretching to France, Germany and beyond, Euro Car Parts are the one-stop shop for motorists, mechanics. Their comprehensive range is considerate of the everyday motorist right up to the motor-fanatic mechanic, offering a choice of 130,000+ car parts, including performance parts, as well as a vast selection of tools, batteries and essentials such as engine oil, anti-freeze and screenwash. A mechanics superstore, Euro Car Parts have all kinds of car parts such a brake discs, suspensions, clutch kits, body panels and so much more. Whether you’re fixing up a customer’s car or tinkering with your own motor, you can save on the right part when you use a Euro Car Parts promo code from vouchercloud. Streamline your motor’s performance and keep the engine purring with all the parts you could ever need available in the touch of a button.